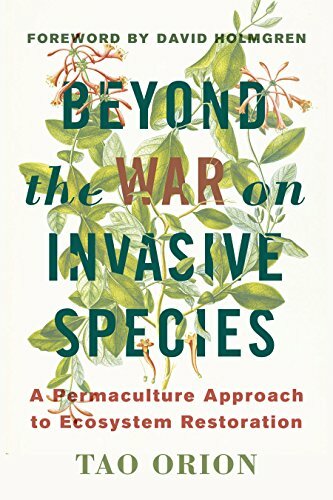 The role of Capitalism in the war on invasive species. Invasive species has been a constant source of thought for me over the past few years. Many of you that have read through my blogs, or that know me in real life, will know that I am not a fan of engaging in poisoning our lands in the name of saving them. Today I am not going to be discussing my feelings on whether these plants belong or not, but rather an issue that I am a huge fan of; the role of capitalism in the fight against invasive species. Whether you are a devout capitalist or a anarcho-syndicalist, one thing is true about money: it can defeat and beat down plants and animals in our ecosystem with extreme ease and efficiency. We have seen it time and again over the past couple millennia, and it shows no sign of stopping. Market hunting nearly wiped out the bison as droves of men (both Native and of European descent) made their way through the plains taking bison for only their hides and their tongues. Ginseng (Panax ginseng) in its wild form is a nearly extinct plant from the Asian mainland due to its overharvest for centuries. Passenger pigeons (Ectopistes migratorius) were hunted to extinction by 1901, and the last captive passenger pigeon died in 1914. Civilized people and their monetary (or pseudo-monetary) systems have laid waste, or nearly laid waste to so many plants and animals that the list would be too many to include here with any adequate explanation. Instead of looking at things through a negative lens, I am going to try and persuade us to take a look through the positive permaculture-minded lens. We humans have created a problem through capitalism and globalized trade networks, and I believe that the "problem is the solution", as the popular Bill Mollison saying goes. If we are going to be able to halt these problem plant communities in their tracks, then we are going to need a whole lot more love and positivity. And we are going to have to challenge how we perceive our environments. So the big question I have is how do we go from making all passenger pigeons extinct, to making all Japanese Knotweed (Fallopia japonica) extinct here in the USA? Capitalism as it turns out is a guiding hand for the poor and rich alike all over the world. Things that are deemed to have value, will indeed be sought after, while those that do not have value (value cannot be expressed in monetary manner) are left to their own devices. The problem we face is two-fold. First and foremost, many invasive species are deemed or at least perceived to be valueless and possibly of negative value. Second of all changing peoples minds on whether or not something has value cannot, and possibly should not occur overnight. If we really want more jobs in America (or any other country), then we should embrace the capability of capitalism to lessen, and possibly rid ourselves of virtually all of our invasive species. We just need to get a little bit crafty with our minds. potentially increase animal life in the forest due to an increase in biodiversity. Garlic Mustard ready to be made into an amazing, and healthful dish. As we can see from the aforementioned list, utilizing Garlic Mustard as a food source has many seen and unseen benefits. I am positive that a more able minded person could find even more benefits for this list. This is just one plant and it is an edible species, but what is there to be done about invasive species that do not serve any immediate benefit to us humans? A plant with benefits to the human stomach is an easy case to be made, but what of plants with unseen benefits to humans? Let us turn our attention next to another worrisome plant in our ecosystem: Glossy Buckthorn (Frangula alnus). Glossy Buckthorn is indeed a spreader. There is no denying it. There is a cedar swamp I frequent that is so interwoven with buckthorn that it is a wonder any other plant has managed to survive. And yet I remain optimistic about our abilities as humans to create an adequate solution to the issue at hand. I don't see a lot of need for those things in the modern world, to be honest. Perhaps the day will come when needs like that will occur again, but as of this moment in history I am not betting on us creating an economy of "Buckthorn Shoe Last Makers". That being said, I can think of a lot of things that we can do with Glossy Buckthorn. The most beautiful thing in nature to me is that there is no such thing as waste. Everything can and will eat every other thing. There is always an eater for everything out there. Humans may not be able to eat Buckthorn, but goats can. Goats can be put into an area with Buckthorn and reduce it to nothing in a few weeks time (Like these people did). Then we can eat the goats, or milk them or if you are a vegan we can stare at them. The most appealing use to me, and maybe its a little old timey, is the use of Buckthorn in wattle fencing. Wattle fencing is a system of fencing that has been around since the Neolithic. I find wattle fencing to be incredibly beautiful and it could look at home in anybodies home garden, or as a fence for your chickens. This type of fencing cannot be more easy to construct in its most basic form, the fencing can last for many years, and as we are talking about buckthorn, the supply is virtually unlimited. It really is as easy as going to a local threatened wetland and cutting down the bushes (nobody will mind), then proceeding to spend the afternoon pretending you are an ancient viking farmer building a pen for your sheep. You can't buy this at the Home Depot, but you can help your local wetland. I am not insane enough to think that we could change the fashion of our fencing overnight, but imagine if we had a multi faceted attack on Glossy Buckthorn, with some people making fencing, others raising goats on buckthorn thickets, and some people making other fascinating projects we haven't even thought up yet. Putting a monetary incentive on the harvest and/or use of this plant could seriously harm the spread of this plant. And that is what we're all after isn't it? But that brings up something that must be mentioned when discussing this subject. The conundrum that we face is that if we place a value on these invasive species, then we risk people forming relationships with these plants and animals. People might get used to using these plants and eating these animals and they might not end up wanting them to go away. At least that is the common fear that is sometimes brought up when discussing things like this. It is my thought that we need to ignore this fear. If our goal is get rid of invasive species, then we must use the best possible options to get the job done. Whether or not the humans that interact with these species form relationships should be of no concern. Perhaps if we change the way we look at these plants, and we harvest and utilize them enough, then they will reach a balance in nature. Perhaps human predation is the missing thing among all of this madness. Perhaps equilibrium can be reached by utilizing our stomachs as well as our minds. The odds that we would overcome the challenges in the past 200,000-300,000 years were probably fairly low. Just the fact that we are here is a testament to our resilience and it is a constant source of optimism for me as I look to the future of humanity. Just take for example that we are the sole surviving species in the genus Homo. If we can make it this far then I am confident that we can overcome the trials that invasive species offer us. The book to the right is a highly recommended read if this subject is of interest to you! I find plant communities and their rampant members to be intensely fascinating. Thank you all for checking out my latest blog. I have been really working hard on studying to bring you all of this content, and new content to come. That being said I now have a Patreon account and I am happy have any and all of the support that can be offered up my way so that I can continue to spread the good news about plants. Support me here. If donation is not your thing, and I understand completely, then think about clicking through any of my Amazon Portals on this website (including the one to the right or below on mobile). Every time you click through one of these links and continue on to do your normal purchasing on Amazon, I get a percent of what you bought and the best part is that it costs you nothing! Merci!